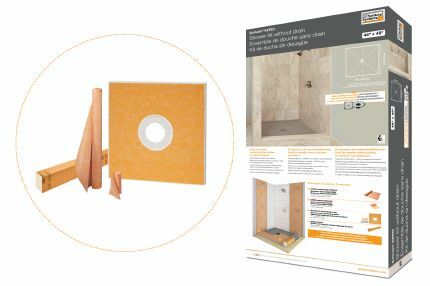 The Schluter®-KERDI-BOARD-KIT combines all of the necessary components to waterproof and tile ready the walls of your bathtub and acrylic shower base using waterproof building panels. 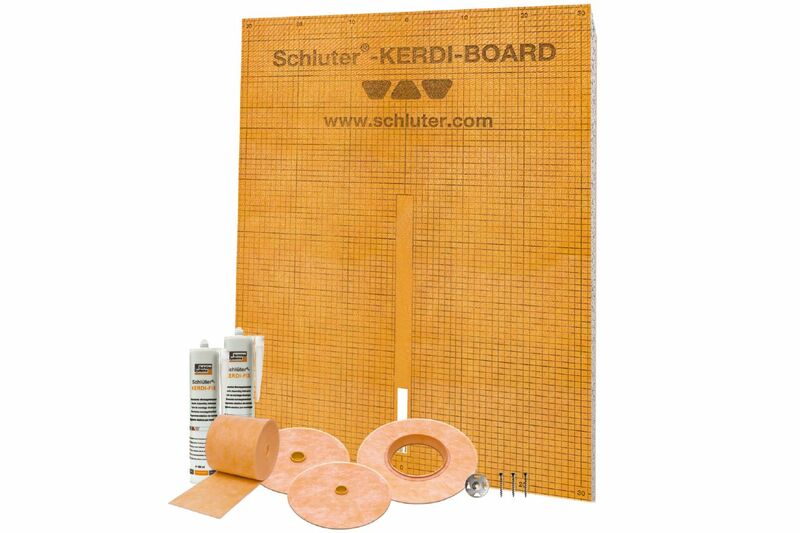 The KERDI-BOARD-KIT provides enough KERDI-BOARD to cover up to 101 ft² (9.4 m²) of wall area. For example, in installations with standard 8 ft. ceilings, the panels included will cover 12 linear feet (3.6 m). 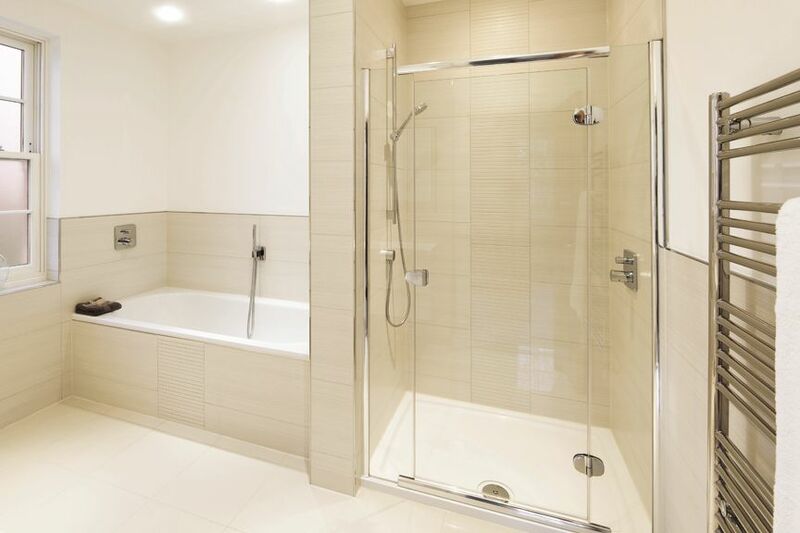 The waterproofing is carried to the height of the showerhead (at minimum). 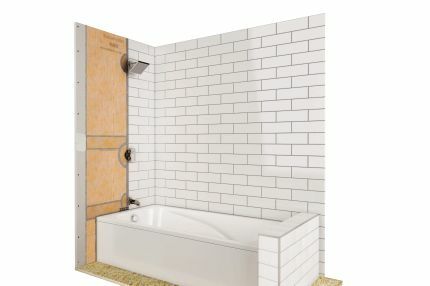 KERDI-BOARD application on the ceiling is optional for bathtub surrounds and showers. Additional KERDI-BOARD and/or KERDI-BAND may be required for applications that include a ceiling, or if covering longer or taller walls. Grab bars or other heavy objects must be anchored in the structure or solid blocking behind KERDI-BOARD. Installation instructions for other applications of KERDI-BOARD (e.g. 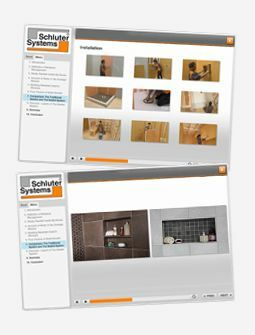 fully embedded or spot-bonded over solid backing) can be found in the Schluter®-KERDI-BOARD technical data sheet. 1. KERDI-BOARD can be mounted vertically or horizontally on framing with appropriate screws (e.g., KERDI-BOARD-ZS coarse thread screws for wood studs [included] and corresponding KERDI-BOARD-ZT washers [included].) If applying over metal studs, use self-tapping screws. Minimum board thickness = 1/2" (12.5 mm) for studs spaced at 16" (40.6 cm) o.c. ; 3/4" (19 mm) for studs spaced at 24" (61.0 cm) o.c.. Screws must reach a depth of at least 3/4" (20 mm) in wood studs. For metal studs, screws should reach a depth of at least 3/8" (10 mm). 2. 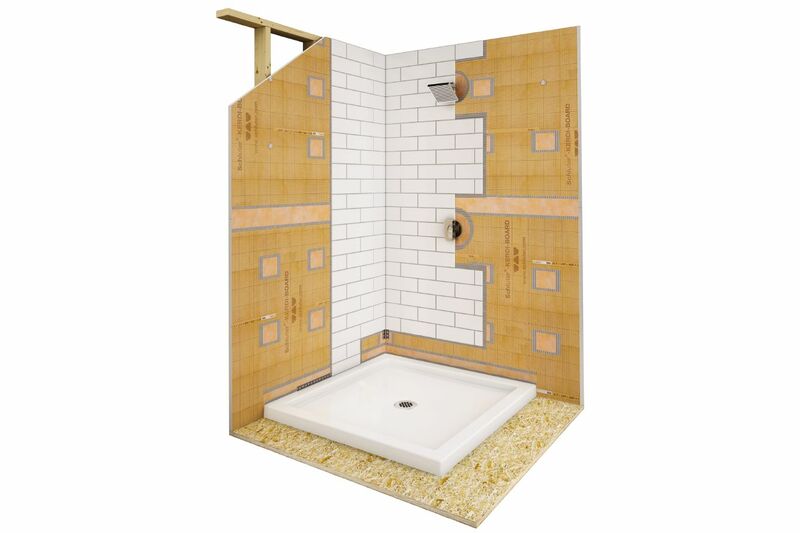 Leave a 1/4" (6 mm)-gap between the bottom edge of KERDI-BOARD and the top of the tub or acrylic shower pan. The back of the KERDI-BOARD can be routered to cover the tub/pan flange. 3. 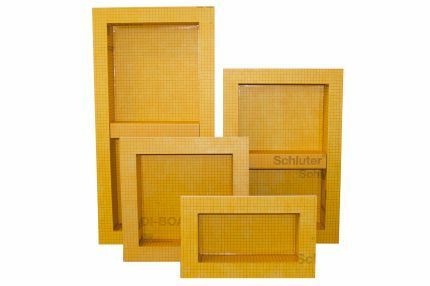 The vertical edges of each panel should be positioned over the center of a stud or other solid backing. 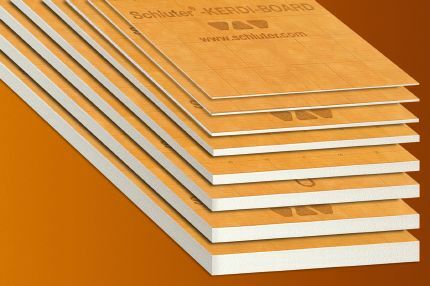 If necessary, KERDI-BOARD panels can be cut easily with a utility knife and straight edge. Screws may be placed between adjacent panels such that the washers fasten both panel edges. The maximum allowable on-center fastener spacing is 12" (30 cm) for walls and 6" (15 cm) for ceilings. 4. 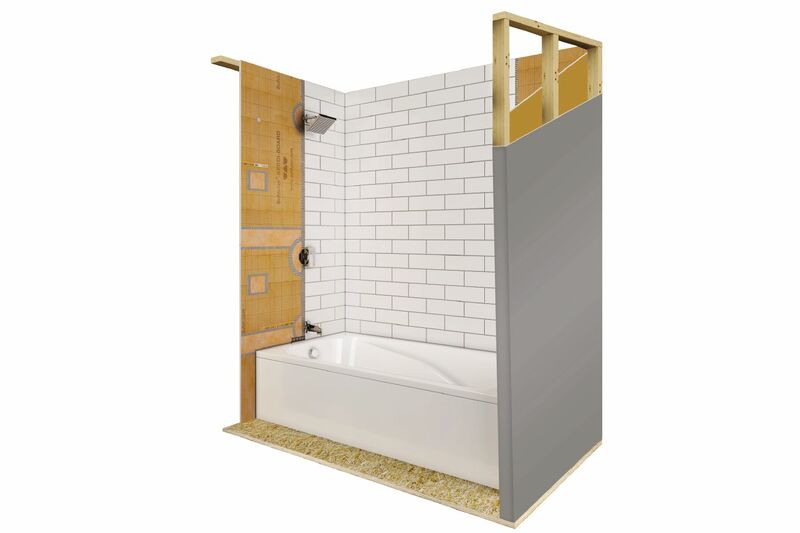 Place painter’s tape at inside corners of the tub deck or shower base for protection. Apply a minimum of 5" (125 mm) of Schluter SET™, ALL-SET™, FAST-SET™, or unmodified thin-set mortar to the KERDI-BOARD using the KERDI-TROWEL or a 1/4" x 3/16" (6 mm x 5 mm) V-notched trowel. Use KERDI-FIX to completely fill the 1/4" (6 mm)-wide gap between the KERDI-BOARD and tub. Note: When KERDI-BOARD is installed above the tub flange, apply KERDI-FIX to the tub flange and spread using a small-notched trowel. 5. Apply KERDI-BAND waterproofing strips. Solidly embed the membrane in the mortar and KERDI-FIX to ensure full coverage and remove air pockets. 6. KERDI-BOARD joints, corners, and fastener penetrations are sealed with KERDI-BAND, ensuring a minimum 2" (50 mm) overlap. Any protrusions through the panel (e.g., mixing valve, shower head, etc.) must be sealed with KERDI-SEAL-PS/-MV, or KERDI-FIX. Note: KERDI-BAND can be folded in half to help corner installation. KERDI-BOARD should be stored flat. In case of outdoor storage, protect the material from direct sunlight and weather exposure.